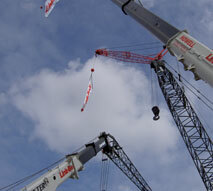 Isom Crane & Rigging Safety Specialists offer a unique program developed and refined from more than 36 years working in the hoisting industry. This training program that is both user friendly and comprehensive in content. Every aspect of our training is designed to where the average student at any level of skill can expect successful completion of both classroom and hands-on segments of training. Training settings can be conducted on-site utilizing the equipment with which students are familiar. Or if you prefer, the training can be conducted at an alternate location within acceptable travel distances for students. Depending on the training requirements, we gear our classes specifically toward any type conventional or hydraulic mobile cranes; hammer head tower cranes; tower gantry cranes; and overhead cranes as applicable. Additionally, all our instructors are seasoned operators and our reference material is state-of-the-art. Contact us today and we will discuss your training needs!